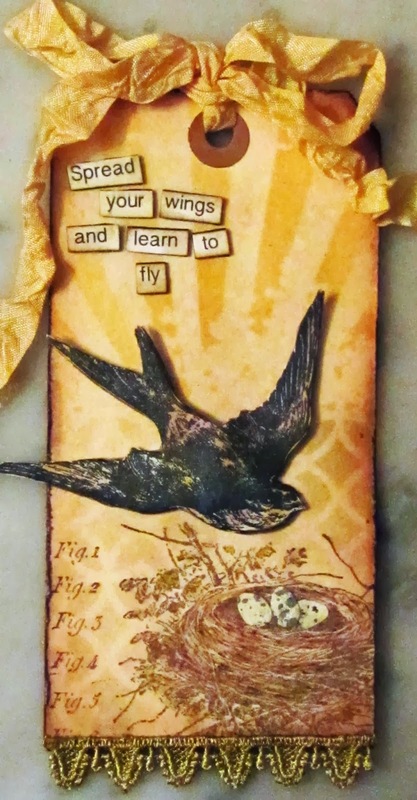 Eclectic Paperie: Spread Your Wings. Hi everybody! 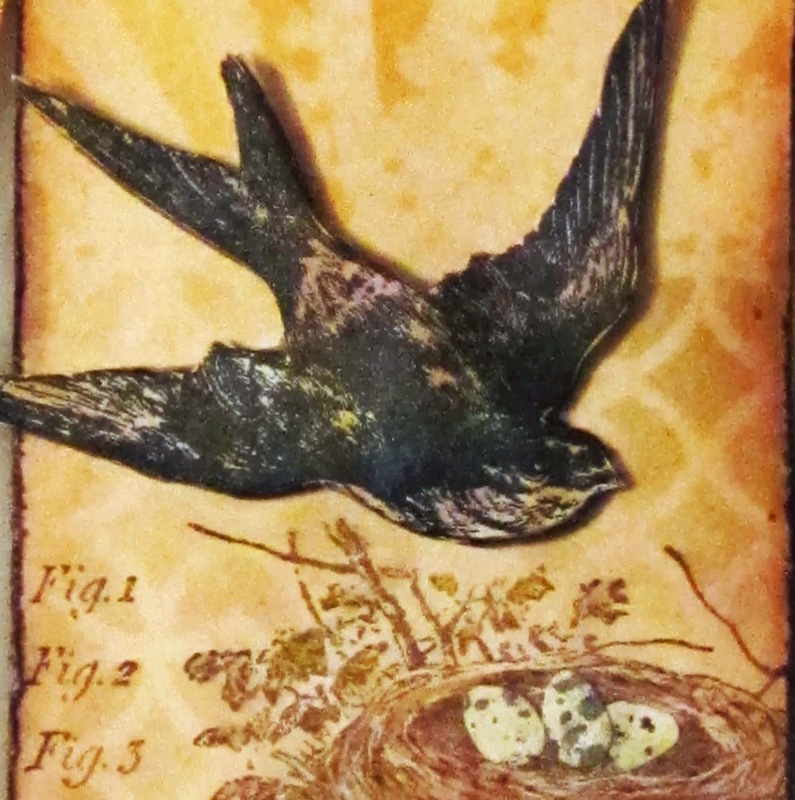 It's Toni here to share a tag I've made using my new Tim Holtz 'Bird Feather 'stamps and Latticework layering stencil. whoopee ! who doesn't like new stamps! When I saw these in the eclectic Paperie shop, I just knew I had to get my hands on them. I started this tag in true 'Holtzian' style, by creating a background putting distress stains on my craft mat and swooshing the manila tag through the inky puddles. I used my two favourites, Pumice, and Antique Linen. 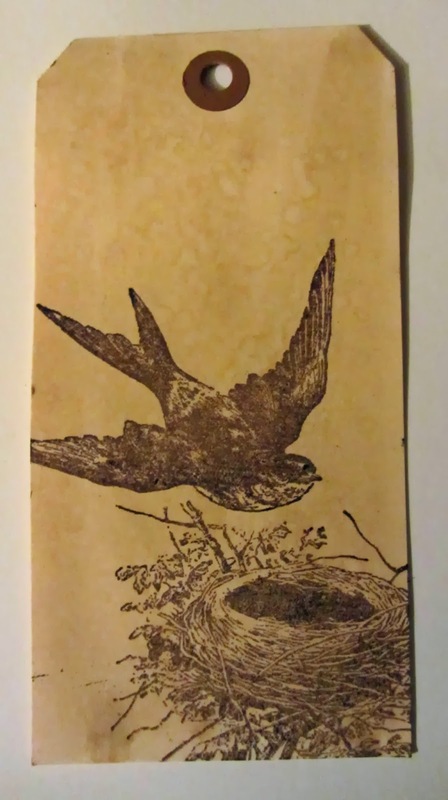 After drying with a heat tool, and doing a bit of spritz and flick with water, I stamped out the bird and the nest with Sepia Archival Ink. 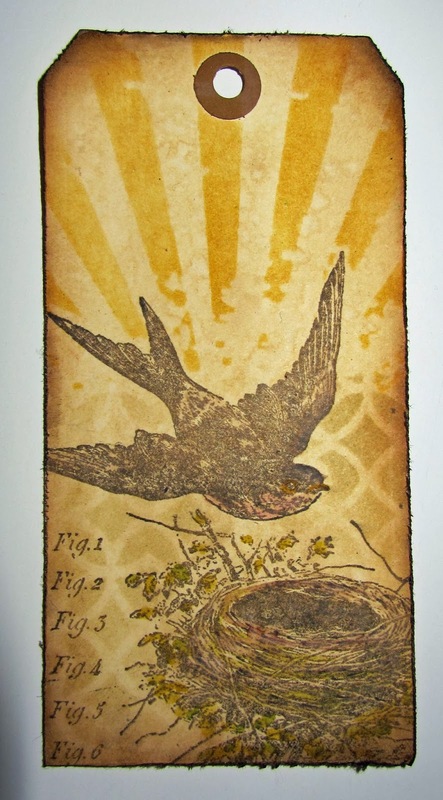 I liked the simplicity of this but wanted to take it a step further, so I made a mask for the bird and then used the Tim Holtz, 'Rays', layering stencil with Scattered Straw Distress Ink, applied with a blending tool. I couldn't resist adding a little more stencilling and used the new Latticework Layering Stencil with Antique Linen Distress ink, in the lower half of the tag. I also stamped out the text from the stamp set. I still hadn't had enough, so I turned my attention to the bird. I decided to give it a bit of dimension and pulled out an off cut of Wendy Vecchi Clearly For Art, that had been on my table since Christmas! I stamped the bird onto a piece of manila card with black Archival Ink and used Distress Markers to add a little' bird-like' colour. I also stamped it onto the Clearly for Art and cut it out. I used my heat gun to shape the bird and then adhered the stamped manila card bird, to the surface with Studio Matte Medium. I used dimensional tape to attach it to the tag. Kim has the eclectic Paperie shop well stocked with loads of new products ! Below are some of the products I've used. What a beautiful tag and using Wendy's Clearly Art stuff to give the bird "flight" appearance is brilliant. Beautiful tag, Toni! Love how you used the Rays stencil too! Toni, it`s so beautiful, gorgeous stamping and stencilling, love it!!! Love it and love the Clearly for Art bird piece. Wonderful tag!!!!! Gorgeous tag. I just adore all the layers and inking. Yowza! It's really beautiful and the stenciled bits really raised it to another level. Toni, lovely card and the directions are wonderfully clear. Thanks and bravo! Gorgeous tag, Toni! LOVE the rays you added and the colors and seam binding, too! Your bird looks so real! Beautiful tag with those fabulous stamps!